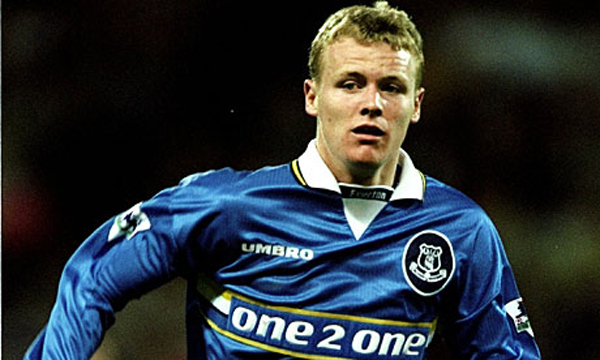 When Michael Ball burst on to the scene during the latter part of the 1996-97 season he looked set for a long and distinguished career with Everton. A local boy and a passionate Evertonian, (despite having begun his youth career at Anfield) Ball was a shining light in a difficult time to be a Blue. Tough in the tackle, but equally composed in possession, Michael Ball could play at left back or in the centre of the defence. Ball was part of the talented Academy age group that went on to win the FA Youth Cup the year after his debut. The “class of 98”, contained Ball, Richard Dunne, Leon Osman, Tony Hibbert, Francis Jeffers and Danny Cadermarteri, all six going on to play at least 50 times for Everton, with two still at Goodison Park to this day. Unfortunately for Ball, who was talented and mature as a footballer, he missed out on the Youth Cup final success, with Howard Kendall preferring him to be part of the first team squad battling to avoid relegation. Ball was quickly becoming a mainstay of the Everton side, even at the tender age of 19. He made 23 starts for the first team in his first full season and even the appointment of Walter Smith failed to harm his chances, with Ball becoming a virtual ever-present in the league, making 42 appearances in total during the 1999-2000 season. The following season, a loss of form and the beginning of the injury problems that were to blight his career hit for the first time, as did one or two disciplinary problems which were routed at the centre of his and Richard Dunne’s eventual departures from the club. The problems started for Ball and Dunne on Millennium eve. After enjoying a big night out, the young friends decided not to show for training the following day. The response from the autocratic Smith was not a surprise. Both players were dropped from all first team involvement for 2 weeks and find heavily. Although both players did return to the team, the relationship between the pair and Smith was severely damaged. After a disastrous defeat to Bristol Rovers in the League Cup, Ball and Dunne were caught laughing and joking at the back of the team bus. Smith was livid, with both players again dropped from the first team. Dunne was sold to Manchester City shortly after, and although Ball enjoyed a brief renaissance, earning himself the Everton player of the year award playing mainly as a centre back, his card was marked. After becoming a full international, earning his one and only cap as a second half substitute against Spain, he was sold to Glasgow Rangers for £6.5m. From this point on, Ball’s career was to be one of disappointment. A significant and long-term injury to his medial knee ligament kept him out of the Rangers team for over 18 months. Ball would later suggest that the poor treatment he received during his time at Everton cost him his long-term fitness and although he fought back into the Rangers team he struggled to recapture the form that made him one of English football’s brightest talents. Speaking to the Sunday Telegraph in 2006 Ball explained the background to his injury nightmare. Rangers were also struggling financially at the time and refused to play Ball as further appearances would trigger additional payments to Everton. With his career stagnating, Ball agreed to pay a proportion of the money owed to Everton out of his own wages. Ball explained what happened in an interview with the Liverpool Echo. “There was an agreement that when I played 60 games (for Rangers) Everton were due more money. It was only four or five games before I hit the number I found out. I didn’t know about it – it was between Murray and Bill Kenwright. “It took a few weeks of talks before we came to an agreement and it was Murray’s idea. He said, ‘I want you to play but can’t afford to pay the money’. For him to pull me in and say that it was clear the finances weren’t there. Although he was now back in the Rangers team, his days at Ibrox were limited. Ball finally called time on his Rangers career with a move to PSV Eindhoven. His time in Holland was not a success, although he did win the Eredivise and reach the Dutch Cup final despite only playing 11 times for the Dutch giants. As was becoming a trend of Ball’s career, injury was central to his failure in Holland. Those 11 games were accumulated over 2 seasons and it was little surprise when he was released. After battling back from injury he joined Manchester City, initially on a six month deal before extending his stay for a further 18 months. After a successful start, the injury curse struck again. With just 6 months remaining on his City contract he broke down in training and a further operation on his knee kept him out for 9 months. That proved to be the end of Ball’s league career. Three appearances for Leicester, all in the League Cup followed, but his career was to end with further disciplinary problems. Ball was fined heavily by the FA for a homophobic tweet aimed at Coronation Street actor, Antony Cotton. Within 24 hours of the FA’s decision to charge Ball, he was released by Leicester, although the Foxes maintain that decision was made purely on footballing terms. The story of Michael Ball is one of tragic underachievement. A tremendous talent who was struck down by repeated injury problems. He will be forever cherished by those Evertonians fortunate to witness him play in Everton blue, but those same supporters will regret that he didn’t go on to become one of the great Everton defenders. Previous Post Seamus Coleman: Player of the season so far? Next Post Even Messi is backing McGeady to be a success!!! Michael Ball has all the tools to be a great defender, however it was never meant to be. The fans will always be fond of Michael Ball, that’s life not everyone fulfils their potential. My memories of bally were a bit more positive I remember a quality left back, great defender who in Bainesesque style wasnt afraid to get forward. I also recall the penalty taking prowess. I thought when he filled in at centre half he was an equal if not better than richard gough on the day. Overall I always thought Ball was a shining light in the darker days of supporting Everton, and someone who could have been a future captain on permanent basis. You wonder, as the article alludes to, how much of his downfall was down to Smith/Knox and his management. Had he been playing 10 years later, he would have been lauded even higher than he was on his break through. I was there at his debut and remembering him being the standout performer, even though he was a substitute (if my memory serves me). Doesn’t say much for the standard we watched in the late 90s!